[frame_right] [/frame_right]Hanukkah “Consecration” begins Dec 8 and lasts 8 days, commemorating the re-dedication of Zerubabbel’s Temple on 25 Kislev 164 BC and the miracle of 1 days Olive Oil burning at the Temple for 8 days. Here is a picture of the Hanukkah Menorah on the Capitol Mall – keep in mind Capitol means Womb of Zeus and Columba means Dove. The Syrian goddess Atargatis (Phoenician Asherah, Ishtar, Easter etc) stands atop the Capitol Rotunda facing East toward the Rising Sun with her back to the Nation and Congress comes from the Latin Congredi “To meet for War”. 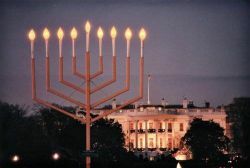 It will help you understand what the National Hanukkah Menorah and National Christmas Tree represent. Both are Heathen (ref Jer 10) ie neither Jewish nor Christian. Hanukkah and Christmas are not one of the 7 Feasts because Hanukkah is no more Jewish than Christmas is of Jesus Christ; neither have anything to do with God. The tall center candle of a 9 Branch Menorah is Shamash, the Akkadian (Gypsy) Sun god. Jesus Christ was hung on and nailed to the Tree between 2 Thieves, forming the 7 Branched Candlestick God told Moses to construct; the Hanukkah Menorah is an attempt to replace it. As Jesus became the “Servant”, Shamash means “Servant”, having root in Samas meaning Sun or Shin meaning Nail. Jesus as “Alpha” was present at Creation; as “Omega” He will be present at the End of this world, but hold on folks..
..that’s not for another 1000 years when Creation is 7000 years old..
and New Jerusalem, New Heaven, and New Earth are re-created (Ezekiel 40-48; Rev 21). As “Melchisedek” (Gen 14:18; Ps 110, Heb 7), He is King of Salem (Jerusalem), Priest of the Most High, Author of the Abrahamic covenant, Authority of King David and Author of the New Covenant, the 8th such covenant between God and Man. Mormon men attaining the Melchisedek Priesthood will use the phrase “Pey Heylel” meaning “Wondrous Lucifer” and the pass grip used by Master Masons with the phrase “Sure sign of the Nail”. Don’t bet eternity on that fellas! Jesus authored the Old Covenant and descended from Judah making Him Jewish; He warned never call any man on earth Rabbi (Mat 23:10). Chabad is the 1st 3 levels of Kaballah “Work upon the Sacred Tree”; specifically the Tree upon which Jesus was Nailed (Shin). Talmudic Rabbis open Synagogue with the “Sign of Shin”, a sign made famous by Kabbalist Leonard Nimroy in Star Trek. Burned here refers to “Holocaust” a “Burnt Offering” to Shamash, the god of Justice in Babylon; itself a word meaning Gate of Marduk or Allah. “Together” refers to a gathering in a Synagogue or Congregation – Jesus warned Christians to stay “Separate” in the Hebrew word “Holy” and Greek work “Ekklesia” to prevent this from happening. Jesus hates the Doctrine of the “Nicolaitanes” because they became the “Elevated Clergy” found today in Synagogues as “Rabbis”, an Arab word stemming from Rab meaning “My Great One” and in Congregations going by the title “Father” or “Reverend”. 25 Kislev 164 BC occurred at the Solar Solstice – 9 months after the Ecclesiastical New Year began and the Spring Equinox Sun first rose in Pisces. The Fish Symbol is not Christian nor is the Dove. These symbols were used during the Inter-testament period by Nabattean Arabs as attributes of the Syrian goddess Atargatis (aka Cybele, Aphrodite, Ishtar, Astarte, Isis, Easter etc). The Aramaean (Syrian) symbol can be seen on the Aquarian Cross at Glastonbury symbolizing the coming of the Infant of the Nativity “Marduk” known to the Druids (Knowers of Trees) as King Arthur; it is also called the “Golden Mean” or “Ratio of Life”. 2160 years earlier a similar astrological event happened just 24 years after the Flood in 2324 BC as the Sun rose in Aries. Now the world anxiously awaits the Age of Aquarius and the coming of the “One” whether it be Buddha, al-Mahdi or Krishna matters not so long as he is the Prince of Peace. Pope Benedict XVI also got into the act, calling for a One World Government, a New World Order and a World Central Bank with corresponding Worldwide Authority and Universal Jurisdiction. If it sounds a bit like www.One-heaven.org/ “Day of Divine Judgment” set for 12/21/2012 it is likely no coincidence. Syrian Rebels released a video at the start of Hanukkah claiming Syria used Chemical weapons on civilians in Aleppo. Israel claims the IDF has proof as well. In another FSA video Al Qaeda is seen mixing and readying Chemical weapons in Turkey for use in Syria in front of a banner “Al Qaeda Batallion for manufacturing Chemical Gas” in Arabic; Folks the FSA is Al Qaeda, the US armed and trained them in Benghazi. These events are the proverbial “Red Line” Obama, Clinton, Panetta have all committed to. I serously doubt all this was coincidence with Hanukkah. Folks, I mean no disrespect for Jews who celebrate Hanukkah or Christians who celebrate Christmas or X-Mass; I’m merely pointing out the truth of these man-made “Holy Days” is not what it appears. Hanukkah aka Festival of Lights are purely Luciferian “Holy Days” celebrated as Saturnalia aka Father Time, Chronus or Chaos. It’s Time to accept Jesus Christ as God in Flesh before Time runs out!